Sheet pan Provençal Cod, Potatoes and String Beans fulfill a desert craving for seafood! Put a rimmed baking sheet in the upper third of an oven and preheat to 475°. Combine potatoes, 2 Tbsp olive oil and ½ tsp herbes de Provence in a large bowl; season generously with salt and pepper. In a separate bowl, combine the beans, 1 Tbsp oilive oil and the remaining ½ tsp herbes de Provence; season generously with salt and pepper. Remove the hot baking sheet from the oven; add the potatoes in a single layer on one side of the pan and the beans on the other side. Roast until the potatoes and browned and the beans are tender – about 20 minutes. Meanwhile, combine the tomatoes, olives, remaining 2 Tbsp olive oil, the lemon juice. ½ tsp salt and pinch of pepper in a small bowl; set aside. Season the cod all over with salt. Remove the baking sheet from the oven. If potatoes and beans are done, remove and keep warm. If not done, push to their sides leaving a space in the middle. Place the cod in the middle of the pan and top with half of the tomato mixture. Roast until the cod is opaque – 10-12 minutes. Sprinkle the potatoes with parsley. Serve with the remaining tomato mixture. Notes: In my oven, the beans and potatoes were done at 20 minutes. I left them on the the cod and the beans were a bit overdone by the time the cods was done. Check them while the cod is cooking, to be safe. I could only find a long filet of cod with a narrow end. I folded the narrow end under the thick end sandwiching some of the olive and tomato mix in between. It worked fine and was colorful and tasty. 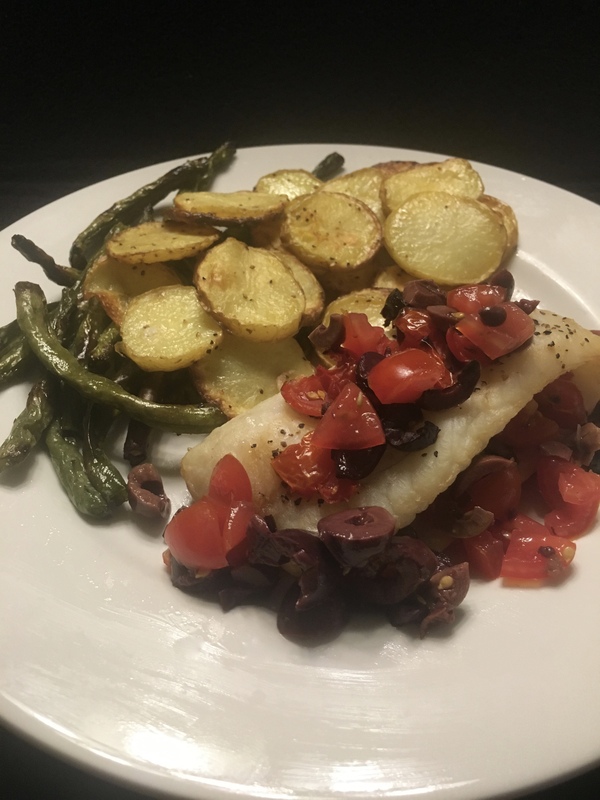 This recipe reduced easily to one serving with a single cod filet and smaller portions of beans and potatoes. I did the full recipe of the olive, tomato lemon mix and enjoyed what didn’t fit on the cod right out of the bowl with a spoon! Have you ever scored a pickup at a salad bar? It can happen. Flattering lighting, arrays of exotic beauties calling for a closer look. Taking them all in with your eyes and finally choosing one to take home. Once you score, you’ll find yourself hanging out at the salad bar more and more often… and maybe venturing to the hot foods bar, the olive bar, the ceviche bar and on and on. With a focus on cooking for one or two, it is easy to get hooked on the salad bar scene. No need to worry about planning for leftovers, pick up something fresh in a useable amount and enjoy. It is a nice way to get variety in your side dishes and concentrate on a great main dish. It makes mealtime a pleasure instead of a chore and sure beats take out fast food or yet another sandwich supper. A craving for cruciforms, but not for whole heads of cauliflower, romanesco or broccoli is satisfied by a few florets of each from the salad bar. Take them home, roast them on a sheet pan and your side dish delimma is solved. Florets of cauliflower, romanesco (a green cauliflower) and broccoli pan roasted in the oven provided a healthy fiber-rich side dish without a ton of leftovers in the crisper. Since the oven was hot, a small oven-roasted sirloin steak was a wonderful main dish treat. A bonus was the discovery of a watermelon, feta, mint and jalapeño salad that could not be passed up! What more could a salad barfly ask? Sometimes, it is hard to decide between two toothsome beauties, so take them both home and enjoy! Rainbow carrots with a mix of kale and radicchio were terrific with a light vinaigrette. And the house rule of three tiny roasted potatoes provided the starch for the meal. 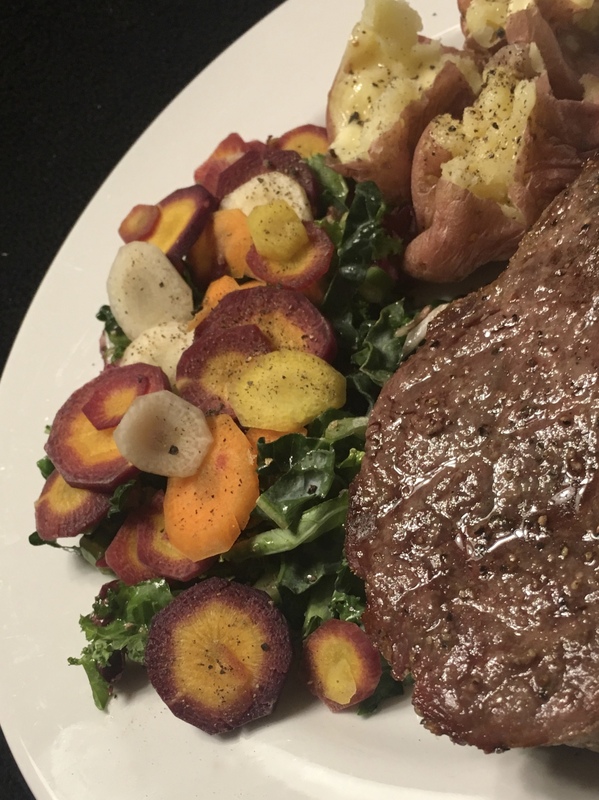 Rainbow carrots atop kale and radicchio brighten up a steak and potatoes supper. By the way, steak is not an every night protein here.